Spare a thought for Sarah Sands. She’s the editor of the London Evening Standard. 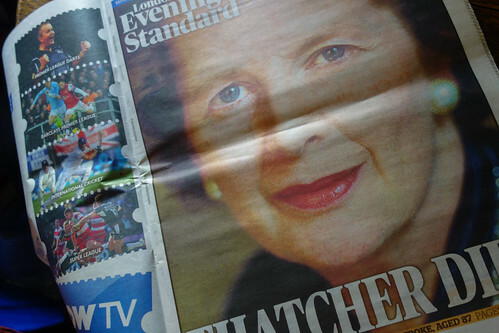 The news of the death of ex-Prime Minister Margaret Thatcher broke just before 1pm today, which meant that her paper could be first on the streets with coverage. I’m not sure what print deadlines are like at the Standard now it’s a free newspaper. But I know that the paper was re-written from an earlier lead detailing the tragic death of yet another cyclist who was in an accident with a lorry. We can imagine that they had perhaps an hour to put together their Thatcher coverage before the final edition had to start rolling off the press. 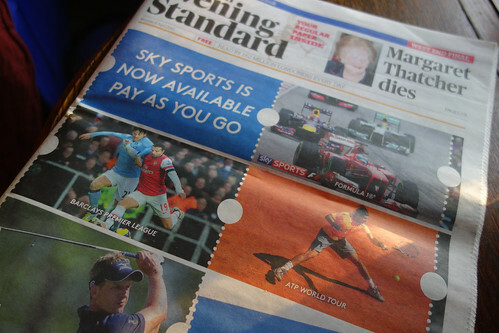 So she will have been thrilled when she realised that today was a day the Standard’s sales team had sold a wraparound cover to Sky promoting their Now TV service! Free papers have always featured wraparounds, although we’re seeing more of them on paid for titles. And this one was time specific as they were explicitly promoting the Manchester derby as being available for streaming on demand this evening. So the paper wanted to run this cover. But had to go with this one instead. Not quite the dramatic impact they’d have liked. And the sales team bank the advertising revenue while the editorial team don’t get the dramatic cover they really wanted.